Andi teams up with DC's greatest Villains in the latest LEGO adventure. 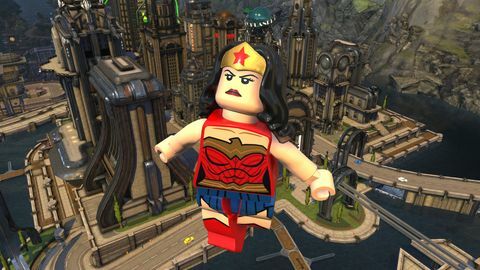 LEGO Games have come a long way since their debut over a decade ago, and LEGO DC Super Villains outdoes itself once again. 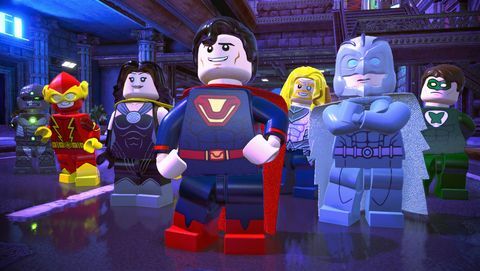 After countless titles in the DC Universe alone, a developer could be forgiven for struggling to come up with fresh and new stories to tell, but TT Games has flipped that on its head with LEGO DC Super Villains, taking the antagonists from previous games and making them the main characters. The result is a refreshingly quirky jaunt through the streets of Gotham, Metropolis and beyond. While the foundations of the "LEGO Game experience" remain rigidly in place, a focus on storytelling and a cast of highly entertaining oddballs inject just enough fresh blood into the game to distract from tired tropes and antiquated gameplay. Super Villains kicks off with the titular characters wreaking havoc throughout the world. Lex Luthor hatches a prison break – freeing a number of dastardly crooks, and catching the attention of Superman. Meanwhile Joker and Harley Quinn are wreaking chaos throughout Gotham, resulting in a visit from everyone's favourite Caped Crusader. The "Justice" Syndacite have a familiar air about them..
An epic showdown culminates between DC's villains and the entire Justice League, and while this might be the last epic battle in any other game, the story takes a sharp right-turn when the Justice Syndicate arrives to lend a hand. It would appear our main characters are on their way back to jail, but in a shocking turn of events, the Justice Syndicate betray the Justice League; banishing them to another dimension. In a classic case of "no one picks on my brother but me," our Super Villains form their own super group to take back the world and send this so-called "Syndicate" back where they came. And as Harvey Dent once said: "you either die a villain, or live long enough to see yourself become a hero." ...or something like that. Join the fray with your quickly assembled custom character. Getting to control such iconic baddies is an absolute blast. 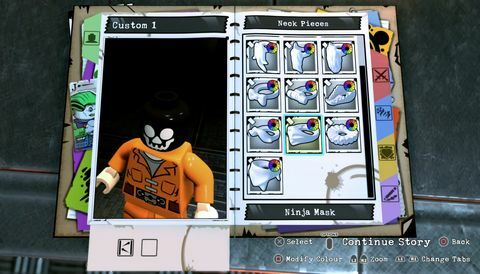 While previous LEGO titles have offered a custom character creator as an afterthought, your original villain is put front and center for the entire story. While the initial creation does make for a rather stilted start, it's off to the races soon after. Plus, there's plenty of pre-made models for those that don't enjoy scrolling through appearances and abilities. For those that are in it to play their favourite DC villains, they're not ignored either. As soon as character creation is finished, players are free to swap to a more iconic bad-guy from DC's massive cast. Anyone that's played a LEGO game before will feel right at home here. Blasting through levels, you'll be smashing apart LEGO creations, building contraptions, solving puzzles, and teaming up with your favourite DC bad guys & girls. A lot of thought has been put into how to showcase each Villain's powers, and each makes for a real treat to play. There's really nothing like brandishing the comically over-sized mallet while rolling around as Harley Quinn on roller skates, and Joker's ability to assemble goons to carry out his dastardly plans feels really on point for the character. Puzzles are simple enough to keep gameplay moving forward, but are over-used and become repetitive quickly. While you may not get stuck on them, they become frustrating nonetheless. "Simple but repetitive" sums up Super Villains' gameplay as a whole, as there's very little beyond thrashing your way through levels and unlocking the occasional collectible. This won't come as a surprise to those familiar with anything else in the LEGO series, as the games have resisted any evolution from their formula. It's understandable when you factor in the target audience is considerably younger than anyone that would notice the repetition, so it's likely to have been chalked up to "if it ain't broke, don't fix it." Still, being able to get all the collectibles in a single playthrough would really help cut out the monotony and frustration for those that don't want to go back through each level on free-play. Losing one's character amongst a mob of NPC allies and enemies is another common issue in LEGO games, and unfortunately Super Villians falls prey to the same bungling mess. A frenetic escape can be quickly hindered when you go from taking out prison guards, to zapping your loyal henchmen. And while players are hardly penalised for their non-prejudiced target practice, it does takeaway from Lex Luthor's genius when he detonates a bomb on top of half his minions. Super Villains' open world has plenty to see and do. The breadth of exploration is impressive, with levels spanning right through Gotham and Metropolis. And while the simplistic design of LEGO bricks and characters within the world might lead one to believe these games are put together quickly on an assembly line and shipped out, a closer look makes it apparent that's not the case. Incredible care and detail can be seen throughout the world of DC Super Villains – from the eerie lighting of a Gotham street at night, to wood-splintered funhouse that is Joker's hideout. I almost felt like I was back in one of Rocksteady's Arkham titles at one point. For what many dismiss as a children's game, DC Super Villains has some serious triple-A polish through and through. As the great Mr. Hammond from Jurassic Park would say, TT Games has "spared no expense." Best of all for a kid that grew up on Batman: The Animated Series, Kevin Conroy has reprised his role as Batman, while Mark Hamill has once again taken the reigns of Joker. Hamill's ability to chew every piece of dialogue with maniacal glee had me grinning from ear to ear ( but don't worry, I checked the room for any laughing gas.) Other notable mentions in the voice cast include Tara Strong – fantastic as always in her roles as Harley Quinn, Poison Ivy and more, while Nolan North makes for a fantastically conceded Ultraman. The world created in Super Villains is one of absolute joy and mayhem, with plenty to do outside of story missions. For any completionists you'll find a deal of satisfaction in your typical checklist of activities, while those that are just happy for another LEGO adventure get all that and then some. While it would be nice to see TT Games evolve its gameplay beyond spamming Square as you navigate each level, any advancements made for Super Villains would have gone unnoticed next to the story and crazy characters. 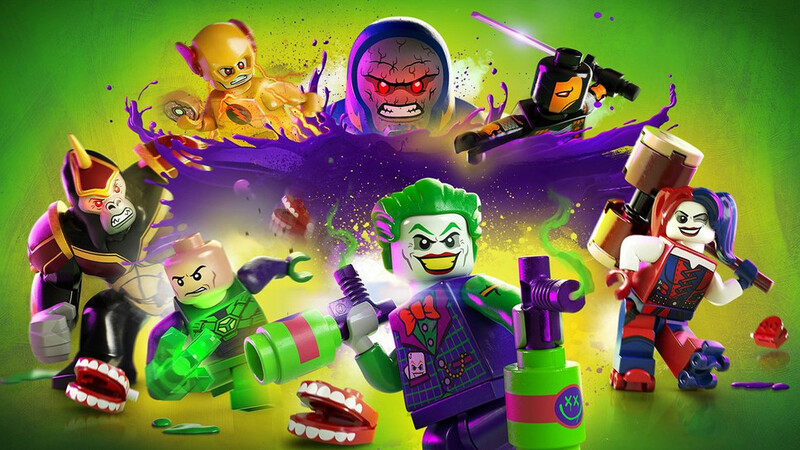 LEGO DC Super Villains is fun, but doesn't reinvent the brick. While playing on the strengths of titles that came before, Villains leans hard into the humorous and quirky narrative one expects from a LEGO title. Ups A stellar cast of villains, matched perfectly with their most iconic voice actors. 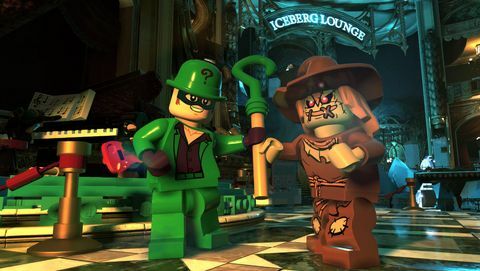 The game doesn't take itself too seriously, leaning hard into the "LEGO" and veering away from the doom and gloom that bogs down DC's cinematic ventures. The art direction is stunning throughout. Downs Gameplay is repetitive, and stale. Combat can be too chaotic at times, forcing players to stop and reorient themselves.